The quality of the end result. This goal is achieved with proper organization of transports, safety, and rapid delivery of merchandise to its end recipient. 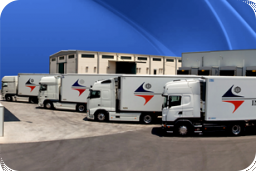 In this way, we are able to guarantee that if we know the special features of each product to be transported, the appropriate vehicle will be used for transporting it, that the cargo will be delivered at the appropriate time, in safety and will be received in a perfect state at its destination at the precise date and time expected. The Company operates successfully as a forwarder using other car ownership and other forms of transport are chartered on an annual basis on behalf of. Are selected with strict criteria to ensure the quality of transport, offering our own media.